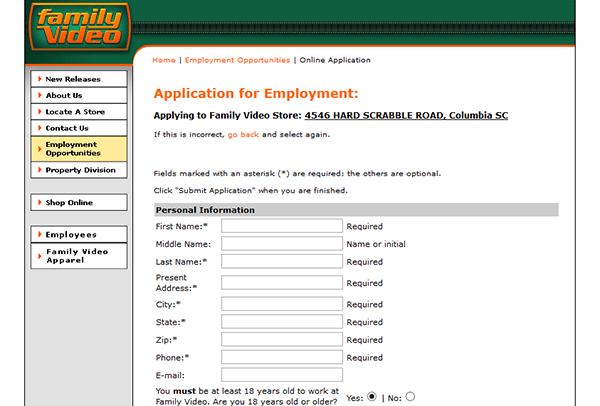 Use the links provided on this page to go to the Family Video job application. It should be noted that only in-store/retail positions can be applied for by following the steps in the guide posted below. 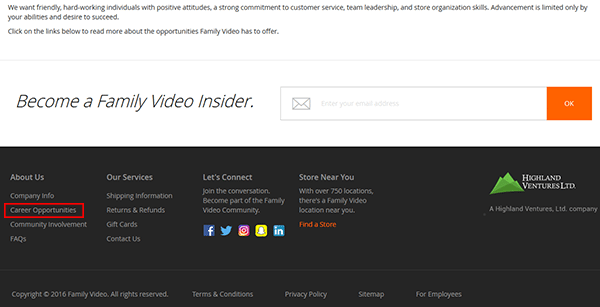 About the Company: Family Video is the largest video/game rental chain in the United States. 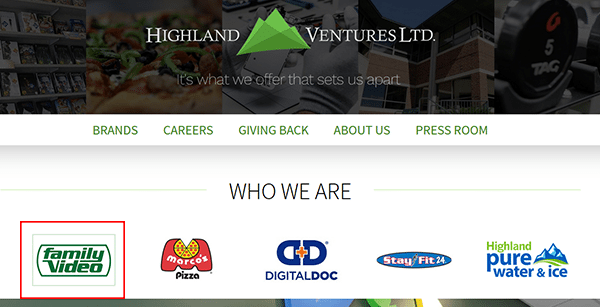 The company was formed in 1978 and is headquartered out of Glenview, Illinois. Family Video operates over 700 locations throughout both the United States as well as Canada. Step 2 – Scroll down the page and then click the “Career Opportunities” link. 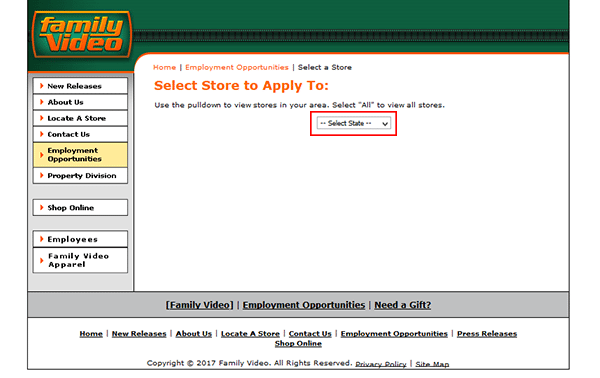 Step 3 – Click the “Family Video” button/link. 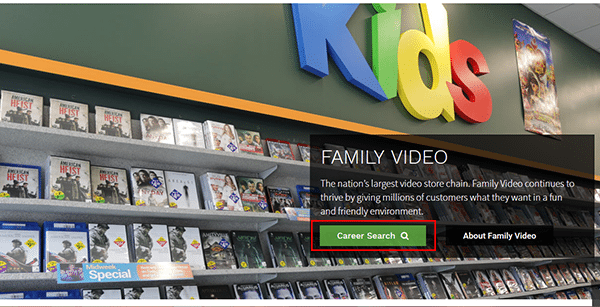 Step 4 – Scroll down the page and then press the “Career Search” button. Step 5 – Hit the link/button as outlined in the below screenshot. Step 6 – Select your state from the drop-down list. 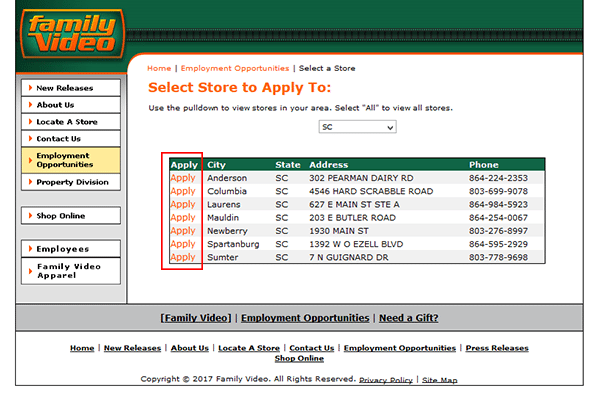 Step 7 – Click the “Apply” link to load the application for the location that you want to apply to. Are you at least 18 years or older? Do you have any relatives working for the company? Step 10 – Enter your availability information. Step 13 – At the bottom of the page/form click the “Submit” button to complete the process.